While there is no easy way to quit smoking, smokers can take some steps that may make it a bit easier to kick the habit. Many people try to quit smoking, mainly after realizing the amount of damage that smoking had been doing to their body. It is never too late to stop smoking, in fact the benefits of quitting start as soon as 20 minutes after quitting. After 20 minutes, the heart rate and blood pressure drops. After 12 hours, the carbon monoxide level in the bloodstream drops to normal. A few months after quitting, the blood circulation improves, lung function increases, coughing and shortness of breath decrease, the lungs get cleaner, etc. These benefits just increase the longer one stays off the cigarettes. Even thought there are plenty of benefits, it does not make it any easier to stop smoking. That first day without a smoke is basically hell; but there is good news. If you get through that day, it just keeps getting easier and easier to stay off. Still, sadly there are no shortcuts, no easy way to quit smoking. However, there are certain steps that can help to quit. They might not make the road easier but will help improve your chances of quitting. First and foremost, one must decide that they have a problem and that they want to quit. You won’t be able to quit just because someone else wants you to, whether that is your children, your spouse, or your doctor. 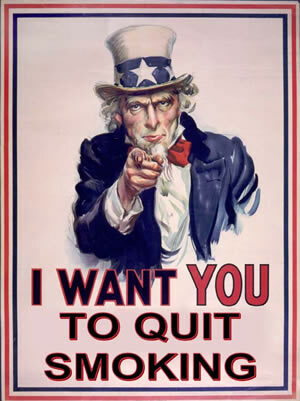 If must want to quit it for yourself. Once you decide that you want to quit, select a day and time that you will quit. Many smokers try to reduce their intake of cigarettes before quitting. However, that leads to the smoker cherishing each and every smoke they do have after then. This ends up putting too much importance on the cigarette, thus making it harder for the smoker to give it up. Going ‘cold turkey’ is one of the best and the most effective method out there. However, it is also one of the hardest. The smoker will feel the worst of the withdrawal symptoms in the first 72 hours. These hours will be torture, but once you successfully get through these, it gets much easier to stay off the cigarettes. That is, unless you succumb and have just one more cigarette, or just one more puff. Reintroducing even just a little nicotine in your body will reset all of your progress, jump start your addiction. Also avoid all substitutes, as they all contain nicotine. So, you’ll basically get your nicotine from a patch on your skin rather than from a cigarette. Despite everything else, stay focused: keep reminding yourself why you wanted to quit smoking in the first place. Say no to yourself when you start ‘just one more cigarette’; it will just negate all your hard work. Keep in mind there is no such thing as just one more cigarette; it’s a choice between smoker and non-smoker. Which one do you want to be?